SpaceX founder and chief executive Elon Musk said Friday the first Dragon spacecraft will likely reach the International Space Station in April, echoing a senior NASA manager's comments earlier this week as engineers update the spaceship's operating software after problems surfaced during a simulation in January. Officials last month postponed the mission's launch from Feb. 7, citing the need for additional work to optimize for the safety and success of the flight. Describing an "insane amount of testing" on the Dragon's control software, Musk said a sizable chunk of the work in the weeks ahead will wring out the capsule's fault-tolerance capabilities, which are designed to respond to system failures without jeopardizing the space station astronauts or the spacecraft. "The critical path task is verification of the systems failure/response matrix," Musk wrote in an email to Spaceflight Now. "Dragon is designed to be tolerant of two failures of almost anything. We need to make sure that the failover systems work correctly in all scenarios." The craft's fault-tolerance is critical, especially when the Dragon carefully flies in tight formation just a few dozen feet below the space station. Such times are sensitive to errors and failures. Speaking to reporters Thursday, Mike Suffredini, NASA's space station program manager, said most of the work left before the mission is minor, but the volume of testing, inspections and simulations was too high to meet a launch date in February. "There are a few changes being made to software that has to go through stage testing," Suffredini said. "Enhancing their tools for real-time operations is a very important thing to us and to SpaceX." The software issues were noticed during a simulation last month. SpaceX delivered the bulk of the software to NASA in November for the Dragon's first flight to the space station, allowing the space agency to complete an exhaustive series of analyses in December. No significant problems arose during the Monte Carlo testing, but a simulation in mid-January exposed some concerns with the Dragon spacecraft's real-time operations tools. The gumdrop-shaped Dragon capsule and its Falcon 9 booster are preparing for liftoff in Cape Canaveral, Fla.
"There are no big problems being worked, but there are a lot of little things they're trying to wrap up," Suffredini said, predicting the mission could be ready for launch by the first week of April. In a Twitter posting Friday night, Musk also said the Dragon will likely berth with the space station in April. But officials have not set a launch date. The earliest the flight could get off the ground is March 20, but SpaceX and NASA say that date is unrealistic. Suffredini said the station management team could select a target launch date by mid-February. The crucial mission, delayed from last year as SpaceX and NASA studied its readiness, has until around the third week of April to blast off before the scheduled launch of a Russian Progress logistics mission to the station, according to Josh Byerly, a NASA spokesperson. Officials want to ensure ample time between the arrival and departure of visiting spacecraft. SpaceX is concluding electromagnetic interference, or EMI, testing to ensure engineers solved an issue with pressure sensors on the Dragon's Draco orbit-adjust thrusters discovered during an earlier round of EMI testing last year, according to Suffredini. 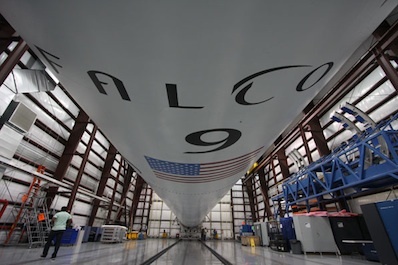 Technicians will also conduct precautionary inspections looking for delamination in the Falcon 9 rocket's kerosene-fueled Merlin engines, and workers will apply high-emissivity paint to meet thermal constraints on the Dragon's propellant tanks. Five simulations are planned between now and launch to test the robustness of the fixed software, and regression testing to check for software errors should be complete by the end of February, Suffredini said. "They've had a number of software modifications," Suffredini said. "I'll say none of them are critical -- all of them important. All of them we agree need to get done and get the regression testing done." The upcoming Dragon flight is a pathfinder for future commercial vehicles that will visit the space station. Suffredini said the SpaceX capsule must meet the same standards as all other spacecraft arriving at the outpost, including international resupply ships from Europe and Japan. But the European and Japanese vehicles come from space station partner agencies, while the Dragon will become the first privately-owned craft to berth with the orbiting lab. Officials say it is in NASA's interest to not only keep SpaceX informed of the requirements it must meet to approach the complex, but experienced agency engineers are regularly helping the company with development and test activities. "I meet with the president [of SpaceX] and Elon about once a week now as we sort through this, and at the technical level, we're meeting every day," Suffredini said. "NASA has been helpful in almost every area of Dragon," Musk said. "They haven't really been involved in [rocket] issues like delamination concerns, but we have certainly kept them informed." SpaceX is planning a countdown dress rehearsal in mid-February, during which the Falcon 9 launch team will roll the two-stage booster to the launch pad and fill it with kerosene and liquid oxygen propellants. Workers will attach the Dragon spacecraft to the rocket before the practice countdown, then remove the capsule for fueling with toxic manuevering propellant, final checks and cargo loading before liftoff. SpaceX is developing the Dragon spacecraft in a public-private partnership with NASA, which agreed to pay the firm $396 million for three Dragon test flights before the capsule begins operational cargo deliveries to the space station. The Commercial Orbital Transportation Services, or COTS, program intends to invest NASA money in SpaceX and Orbital Sciences Corp., which is building its own rocket and cargo freighter. NASA subsequently signed a $1.6 billion contract with SpaceX for 12 resupply flights. After the Dragon's first demonstration mission in December 2010, SpaceX proposed combining the second and third tests into a single flight. NASA agreed to the plan last year, but flight controllers will only approve Dragon's approach to the space station if it passes a series of in-flight checks verifying the health of the craft's guidance, navigation, control and abort flyaway systems. The ship will rendezvous with the space station about three days after launch, and if all goes well, the capsule will autonomously approach the complex from below, eventually coming close enough for the lab's robot arm to grab the spacecraft and place it on the station's Harmony module. Astronauts will later open the spacecraft's hatch and unload several hundred pounds of supplies, none of which is considered by managers to be critical for the space station's maintenance or research program this year. 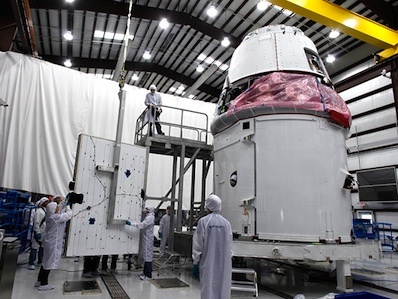 After a few weeks, the crew will release the Dragon to fly back to Earth and parachute into the Pacific Ocean. The ship will be able to return equipment on space station resupply missions. Under a separate agreement with NASA, SpaceX is designing crew accommodations and a launch abort system for the Dragon to carry astronauts later this decade.